Maybe it's not a revolution. Not yet. Maybe it will be put down. But right now, reports are coming out of Iran on Twitter through cell phones and texting, both pictures and words. These reports are fast and furious, but they are individual accounts. Someone looking out their window reports on the marchers in the street, thousands upon thousands of them, all carrying or wearing or waving something green. This picture was posted on Twitpic.com. It is Krimkhan Bridge in Iran - I assume Tehran, but I don't know. This picture is very recent - right now it is 6:58pm in Tehran, so this looks like it could be for real. Twitterers are saying that there is much much more violence than is being reported officially. Students at university in Tehran have been killed - and buried secretly - according to one Twitterer. New York Times is publishing names of Iranian Twitterers - which puts them in extreme danger. 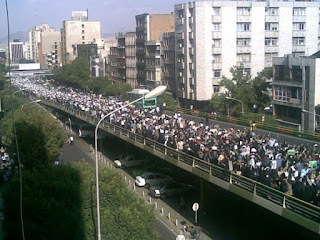 Ahmadinejad's guards are breaking windows and lights in the streets to make it look like the protesters are doing this. Internet access has been almost completely cut - or is so slow as to not be usable. Western journalists are not allowed in. Following Twitter, which, of course, is unverifiable, is the only way to find out what is going on. Imagine what it would have been like if there had been cell phones and texting and twittering in WWII Germany - the Holocaust would have been known about much sooner. Amazing times we live in! !